In two hours, the year 2011 will have run its course. To video games, it was a year of scandal, of disappointment, of surprise and of achievement. Traveling to all parts of the globe, with staff writers on three continents, serving an audience of more than 3 million unique visitors each month, Kotaku chronicled the past year in video games with nearly two posts per hour—more than 14,000 items published. These are our ten most-viewed stories of the past year. 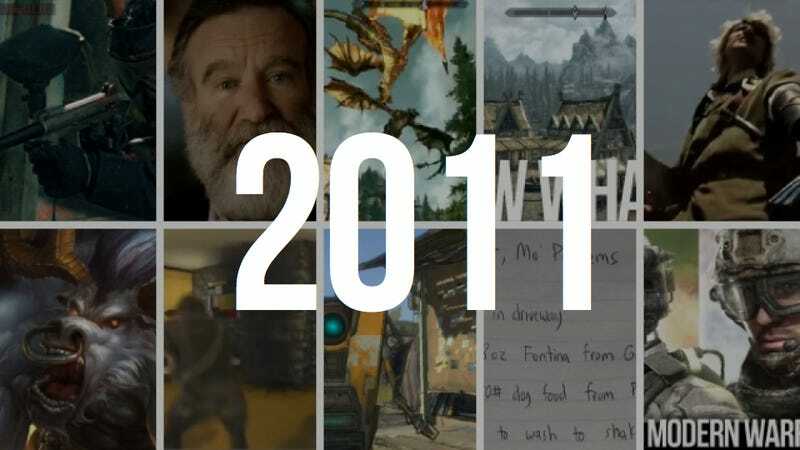 We thank you for reading, for writing, for sharing, and we look forward to delivering you the story of 2012 in video gaming, all over the world, 24 hours a day, seven days a week. Today marks the long-anticipated release of Bethesda's excellent role-playing adventure The Elder Scrolls V: Skyrim. It's a massive game, a true epic-hundreds of hours of exploration, adventure, magic and mayhem. It takes a triforce of courage to name your daughter after a video game character, but Robin Williams pulled it off. And that man is not series creator Shigeru Miyamoto. Nor is it current overseer Eiji Aonuma. It is Doctor Emmett Lathrop Brown. What Happens when You Spawn 50 Dragons in Skyrim? Unlimited Dragons In Skyrim? Sure, Why Not.